Ken Becks of 1stdownscouting.com/1st down joins us to talk about the Browns and the rookie news around the league. Don Davey former NFL player joins us to discuss his career and the plight of the retired players. 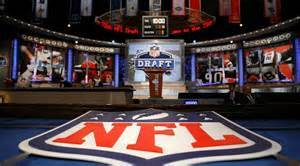 Brian Skinnell sports editor for WSHC radio Washington DC joins us to discuss the Redskins, RG3, and the Wizards draft choice. Jason Clary, Knightcast radio sports host joins us to talk about the off seasons for the Bucs and the Dolphins.